Here’s a quick little tip I’ve been using recently with the new year having rolled around. I’ve started replacing all of my © 2011 code with the following. This will always return the date of the current year. That way you don’t have to remember to update it all over the place every time we “celebrate” a new year. Hey again all, for this post I’ll be covering how to populate a PHP/HTML table by way of looping through a table in mysql. I’ll be using the sample database provided by http://www.mysqltutorial.org/mysql-sample-database.aspx which has to do with models (cars, planes, ships, etc). Everyone has differing levels of knowledge so I’ll be including some basics as well such as connecting to the mysql database (and closing it later on). buyPrice           - Listed price on the "website"
Alright, so now you’ve got your connection to your database and the appropriate database selected. We’ll skip over the other content that you want to eventually add and say (for this example) that we want to list all of our models. We’ll look at doing this a few different ways, first off we’ll go simple and just request everything from the database and then we’ll tell php how to spit that all out to us. The following will allow you to export your mysql queries from mysql to a csv file that can be opened in several spreadsheet softwares. You may need to change the , (comma) to a ; (semi-colon) depending on your software. A note for those of you using my osTicket Reports MOD: This is not what I’m using for that. Ok, so after being on the osTicket forum since July 2009 I’ve noticed that one big MOD that everyone wants and never fully gets is reporting. The following is my stab at it. This MOD has been implemented and tested on 1.6ST and 1.6RC5, please let me know if you run into any issues. Note: For version 3.3+ you will need to create a scp/reports folder (and make sure its writable by Apache) and place the image (csv.png) into the scp/images folder. pChart (for use with emailed reports) requires the GD and FreeType PHP extensions. 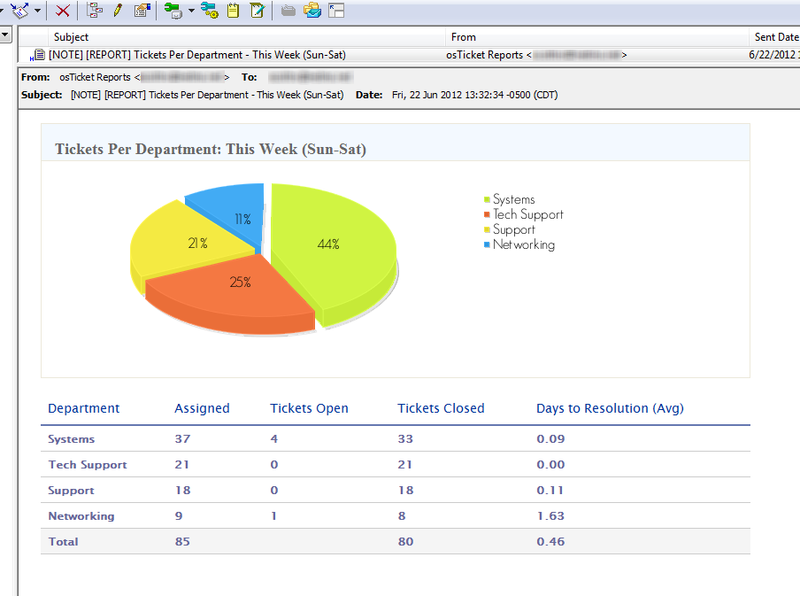 Note: Reports v2.4+ is compatible with Internet Explorer. 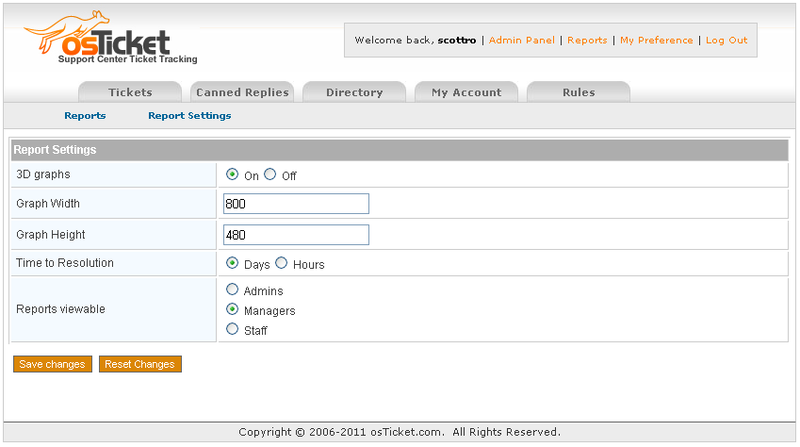 Purpose: Auto-assign tickets that are submitted via email based on their from address or Subject. 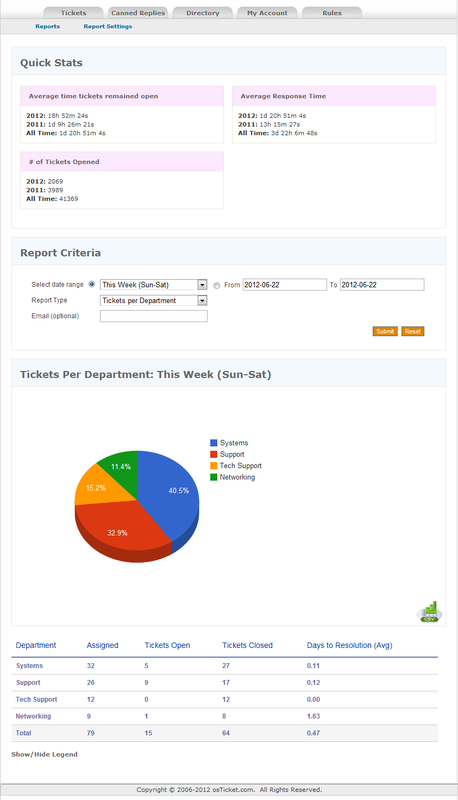 If a ticket is assigned to a staff member it will automatically also be assigned to the department they are in.